Since returning from the most recent cruise, Jim and I have been busy checking on the sick (both daughter Clarissa and Jim’s step-dad Tommy have been in and out of the hospital recently), getting home and into the “groove”of day-to-day things again, and wrapping up (pun intended) Christmas shopping/gift delivery. As a result, I’ve not had (or not taken) time to update the blog. Today, I do. In terms of games, trivia, shows, etc., Carnival was fairly comparable to our experiences on all but one of the NCL ships. On the NCL Getaway, we didn’t like the lack of access and availability to these events; there were too many passengers trying to fit into venues of usual size on that ship. On my other Carnival cruise in 2011 on the Imagination, my mom-in-law and I had trouble making shows, etc. due to timing; we were never out of early dining in time to go. On this ship, we rarely had trouble in making it to trivia, musicals, comedy shows, etc. They were all great! Dining leads me to the thing I like least about Carnival (and probably would be true on other cruise lines). I hate having to have assigned dinner times on a ship in order to experience a nice sit-down for service meal. It is probably one of the things we love most about NCL. Within a large time frame for each of the main meals (breakfast, lunch, and dinner), one can go as one desires to either of at least two dining rooms to enjoy a more formal experience. This is not true of Carnival. On this cruise we were forced to choose an 8:15 p.m. dining time. The first night, we finished about 10 p.m., my usual bed time. When requested, awesome customer service made an adjustment for us, so after the first night, we had a 6:00 p.m. dining time. I still hate having a set time, but early works much better for us than late. Shows on this cruise began at 7:30 , so we could just make it to these events. The overall most frustrating thing on the Dream was disembarking once back to New Orleans. I have to say that most of the problem was passengers who failed to listen (or adhere) to instructions, but the Dream’s staff did nothing that I could tell to enforce the rules given. I’ll leave it at that. Our ports of call were Ocho Rios, Jamaica; Georgetown, Grand Cayman, Cayman Islands, and Cozumel, Mexico. What we saw of the island of Jamaica was beautiful, but the island is obviously very poor. There were tourism officers stationed at fairly regular intervals to watch out for tourists. Jim and I began to wonder if the requirement for these positions were to be tall, slim, and good looking because most we saw fit that bill. Roads we traveled by taxi were in very poor condition, and roadside peddlers, who worked on their wares on the side of the road, literally stopped vehicles and tried to sell items through open windows. Others would perform (example, someone walking on stilts) in the road itself and then try to obtain “tip” money from tourists in the cabs. Prices in shops were always negotiable, which is why we did most of our shopping there. Jim’s favorite part of Jamaica was visiting the “Straw Market,” where locals sold their wares. While there, the entire market worked together to try to find someone who had a t-shirt that was Jim’s size and suited his very specific taste. Grand Cayman was free of people stopping you every two feet to attempt to sell you something, and it was very pretty, though flat compared to Jamaica. Because of trying to get information on Clarissa and then arrange travel home for Jim, I did not go ashore. The details of the town itself come from Jim who only went ashore briefly to get postcards and look around. It sounds like a place in which we would have enjoyed spending several hours of shore time if circumstances had been different. Cozumel still had the beautiful water I remembered from 2011 when making a stop there on my last Carnival cruise, but it seemed to be even more commercial than before, and prices were very high with no room to bargain. It took a long time to make my way through the Duty Free shops through which every single person coming off of the five ships in port had to travel. Then, once through Duty Free and security, it seemed to take forever to find postcards, for which we paid more than in any other port. The attitude of the people in the port area of Cozumel was not appealing. While no one was accosting me trying to sell items as in Jamaica, my impression of those with whom I interacted were that they were more often than not haughty. Jim was not with me; he left for the airport as soon as he could leave the ship in Cozumel. You can read about that here. 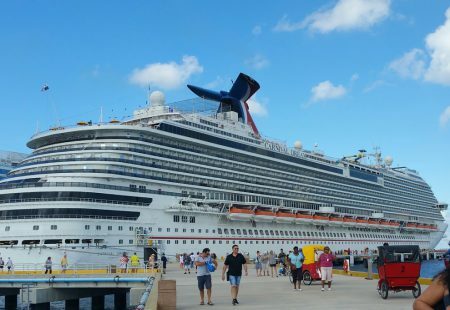 In a nutshell, the ship activities were a great deal of fun, but it was, overall, some of the least enjoyable experiences in ports of call of any of the six cruises I have taken. It seems like what would have been the most enjoyable port outing was missed due to trying to get info and arrangements made related to Clarissa. I had a better overall cruise ship experience on the Carnival Dream than I did on the Carnival Imagination. While Jim and I are not fans of NCL’s large Getaway, he and I prefer that cruise line to Carnival. In terms of ports of call experiences, I think this cruise goes to the bottom of the list, which is sad as we expected great things. Our view of the cruise cannot help but be colored by the family medical emergency that cut it short mentally and literally for Jim and mentally for me. Let’s say that as it was, our experience on the Dream was a dream of mixed emotions and experiences. Who knows how our views may have been different if our personal circumstances had been different. In the end, Jim and I are blessed to have traveled to new places, and traveling is our joint dream.